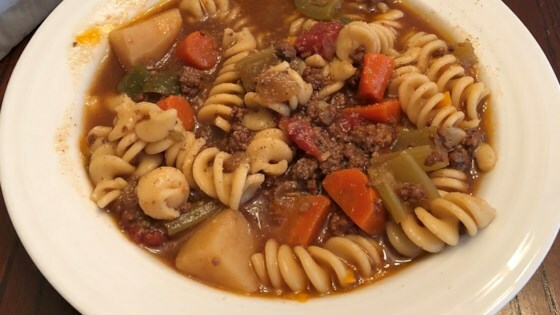 "This hearty soup is easy to prepare and will satisfy even the pickiest kid!" Place the beef in a skillet over medium heat. Mix in garlic, onion, and green bell pepper. Cook and stir until beef is evenly brown and vegetables are tender. Drain grease, and transfer to a slow cooker. Mix celery, Italian-style stewed tomatoes, and mixed vegetables into the slow cooker. Pour in beef broth, soy sauce, and Worcestershire sauce. Season with paprika, salt, and pepper. Cover, and cook 7 hours on High. Mix pasta into the slow cooker during the last 15 minutes of cook time. This is one of the best soup recipes I have ever tried. I make a double batch and freeze it every time. I just introduced it to my neighbour who wants a copy of this recipe as well. Fantastic!!! Great receipt - even my kids loved it - I added more noodles than it called for but it was still great!! !